The new(ish) Trollbeads Bangle was introduced back in early November 2012, as part of the Christmas Collection, so you may be wondering why it's taken me so long to get around to talking about it? I loved the look right from the start, a plain solid silver bangle, designed to be worn with a few beads that are kept on by stoppers. 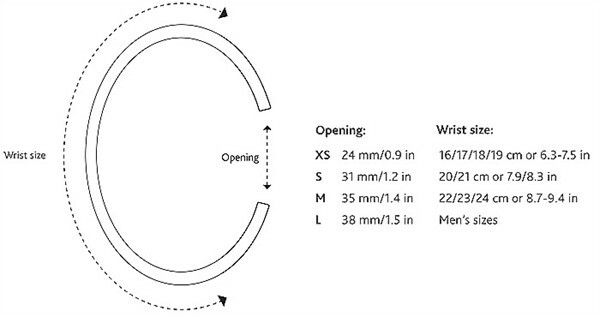 It comes in 4 sizes, XS, S, M, L but buyer beware, it is definitely a try before you buy as a lot of people have been surprised to find they needed an XS bangle! 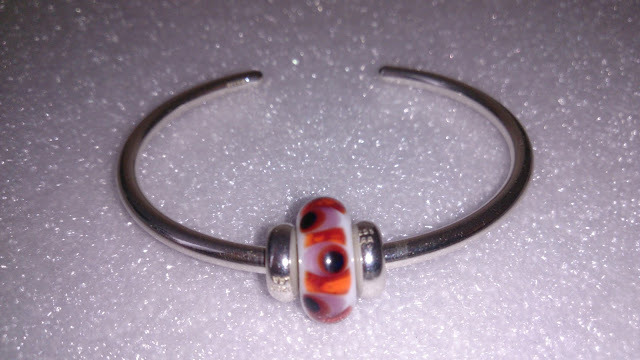 Well first of all it was the price, £90 for the bangle on it's own, without stoppers. This has been offset by some of the promotions from Trollbeads and retailers alike, firstly the buy a bangle get 2 free stoppers and more recently with the much coveted Aurora glass bead that's only officially available as a bangle set for £125. Either way it's still a significant investment. So, er, it was still the price that was putting me off. I also really wanted an Aurora bead but I wasn't prepared to buy a bangle set just to get one. So what on earth possessed me to finally buy one, an XS bangle, at our recent Troll Date? Full Troll Meet Haul - stones, ooaks and finally a bangle! I'm still not 100% sure, probably because I really wanted one, maybe it was the generous discount Beaverbrooks gave us on the day, possibly because I managed to try on Alison's without fainting or vomiting... I still felt rather uncomfortable, but mainly I think I finally went for it because they look SO good, which is a great motivator for wanting to try and get past my phobic aversion to putting it on and taking it off again (it's absolutely fine whilst on). I didn't want my new bangle to just become an overpriced bead display stand for my blog photos - so how should I overcome my fear and more importantly my phobic reaction? I wore my bangle out on the Friday night of the troll meet, with one bead and my stacked pink combo for Alison, it wasn't pleasant putting it on... luckily when it came to taking it off I was so tired (and full of cocktails) plus I was already in bed! 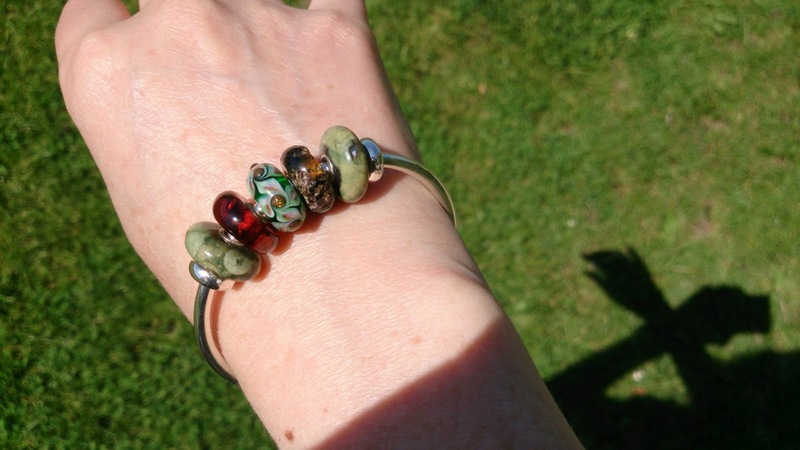 Friday's bangle - last day of May! Therein a desensitisation plan was born, for those of you who've never had the misfortune to suffer from these types of reactions, I salute you, for those of you who have/do, you may understand my wish to overcome this, or you may just think I'm slightly crazy in that if it makes me feel that bad why bother in the first place? 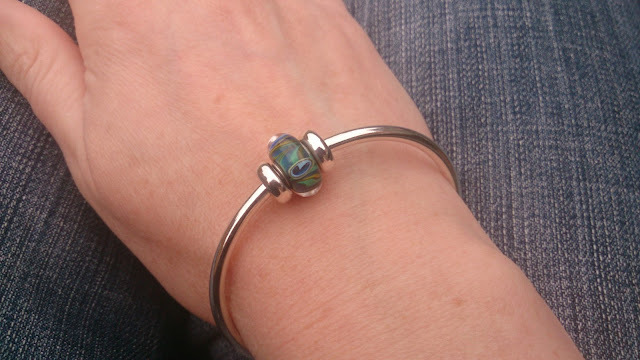 As I said before I really like the bangle, and seeing so many on our Troll Date in person just strengthened my resolve to give it a proper go. So my plan was simple, I'd try wearing it every day, and to help with the feelings it evoked I'd put it on and take it off in bed, therefore if I felt wobbly I would already be in a comfortable place! I loved Saturday's combination, I wore it nestled in a twisted leather design with my new Summer Stones to show off to the girls on our night out. I had a bit of a set back on the Sunday, so decided to give it a miss and try again on Monday! Monday's trial went okay, bit of a problem getting it off *shudder* but no problems wearing it at work whilst typing all day! I was really pleased as I've had the ooak above with it's lovely metallic buds for a while but it's not made it onto a bracelet, however the bangle is perfect for wearing single beads to show them off. 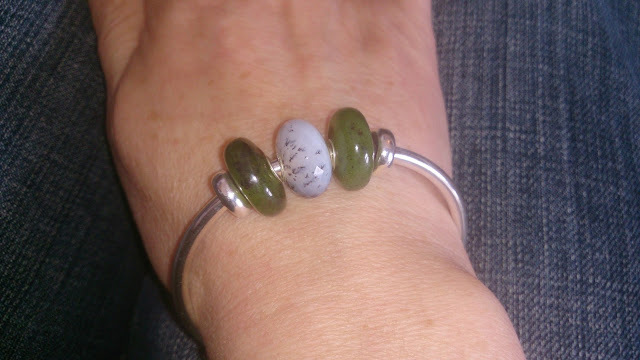 Tuesday I had to try the bangle with the Aurora bead I had kindly been sold by a friend who had two and only wanted one. 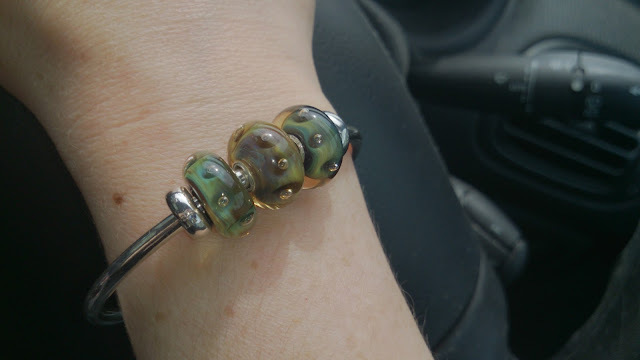 The Aurora bead was the original reason I was tempted to try the bangle, however it was quite ironic that I bought the two separately on the same weekend! It was a really sunny day on the Tuesday, I took this whilst I was sat in the garden after work, the Aurora bead is lovely regardless but incredibly pretty in the sunshine! So what to wear tomorrow? 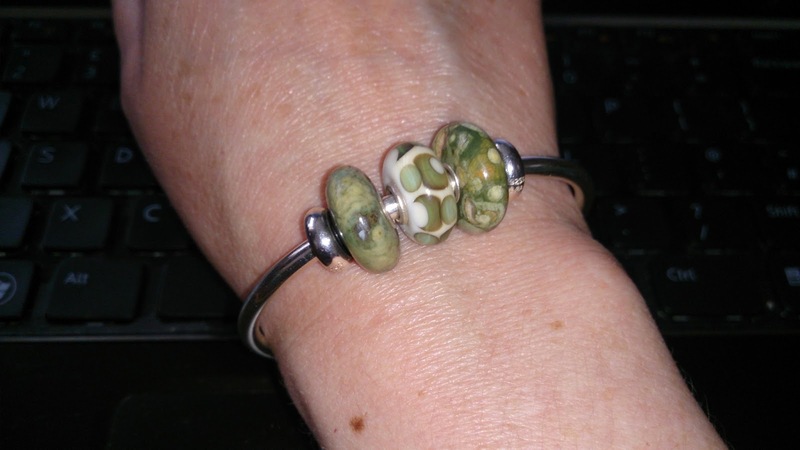 I decided to try the bangle with 3 beads as I'd been wearing it with just one bead but I was feeling a bit braver about adding more. This went well, and I've been getting a lot of good use out of my new ooak (unique) and time to use some of the new Summer Stones on here, 2 of my Rhyolites! During the evening I tweeted a picture along with my snack for the evening, popcorn actually makes quite a good background... and my bangle was toasty warm when I put it back on! After mastering 3 beads I decided to go for 5! For Thursday I just added some ambers to my existing combination, I was out walking the dog and it was sunny again so I took a photo - this photo makes me laugh as the shadow shows you exactly the weird things I do when taking photos! So Friday... end of the week, what to wear? How about LOTS of Summer Stones! 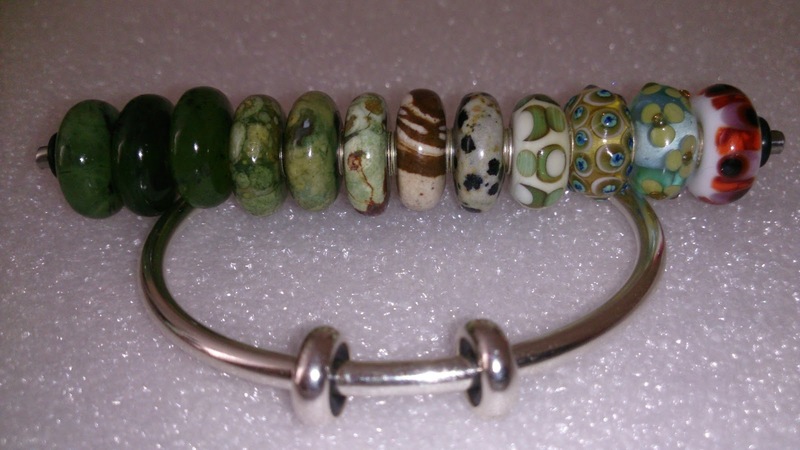 So I'd managed a week with the bangle bar one day, I'd tried 1, 3 and 5 bead combos and I'd not passed out or thrown up, so far so good. 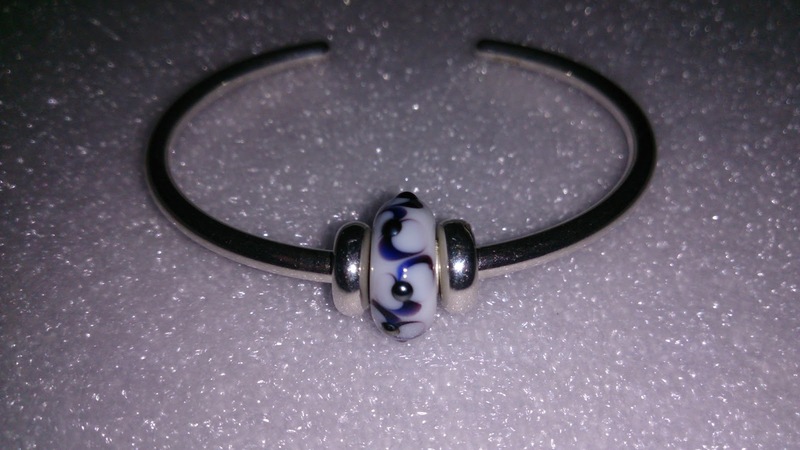 Wearing 5 beads certainly makes the bangle a lot fuller, and harder to pull apart when taking off and putting on, not that you can move it much as it's solid silver - but it is possible to make it a little easier as it will move apart very slightly. In experimenting with ways to wear my bangle I'd also tried different ways to put it on and off, the least worst way for me is to put it on above my wrist, via the inside of my wrist sideways on, about an inch above the wrist bone, and then slide it into place whilst twisting the opening to the back and then down to sit on my wrist under the wrist bone. 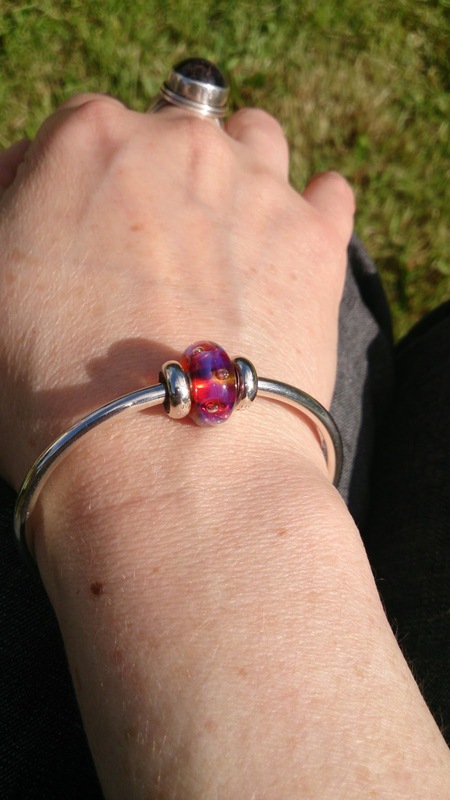 I can categorically say that my experiment in trying to put it on under the wrist bone was a disaster, I almost ended up with a bangle pierced hand... well I had to try everything! After a week of solid wearing it was definitely getting a bit easier. 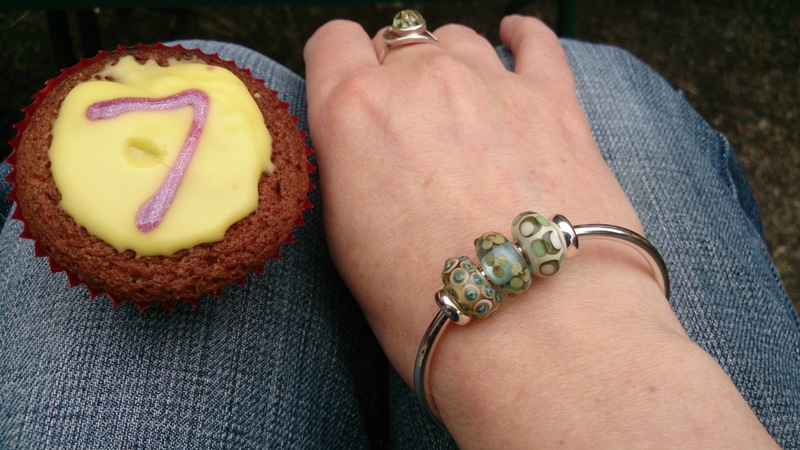 So to celebrate the previous 7 days/ways of wearing my bangle, Day 8 saw me with a no.7 cake! Tasty! What also happened on Day 8 was I received some new discounted beads , and not just the ones I was wearing that day from the Troll Date! 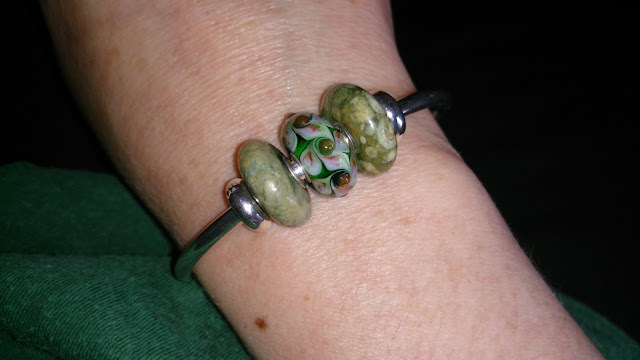 Finally I have a peacock and wasted no time the following day to showcase this on my bangle - Day 9! So on Monday I decided to wear all 3 of my new new beads and let the train take the strain! Tuesday's bangle was back to some of the Summer Stones and the ooak (unique) that matched so well! 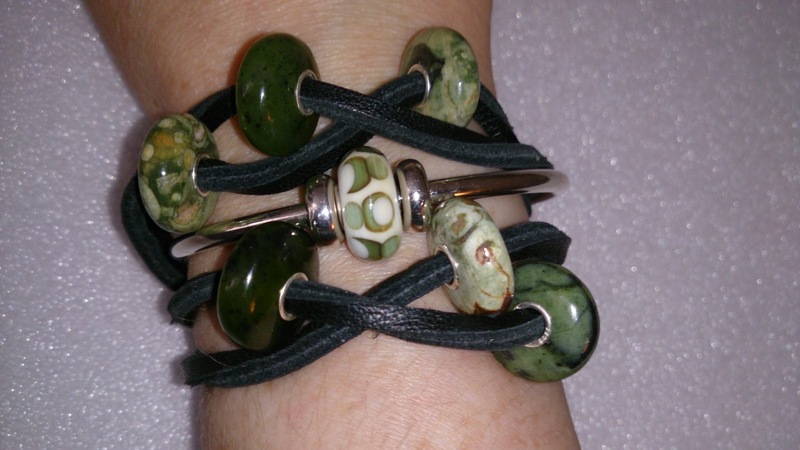 Wednesday saw more Summer Stones, Canadian Jade again and a new stone, Agate Dendritic! I liked this so much I wore it Thursday too! 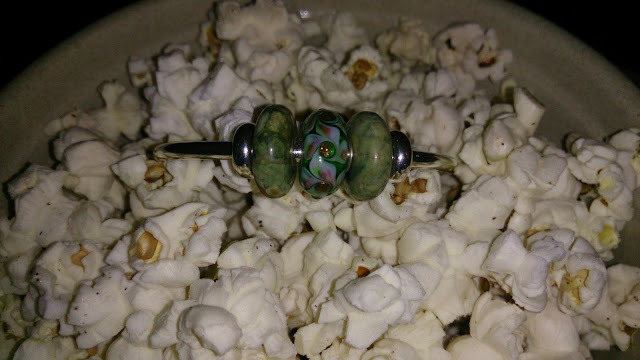 Friday and I wanted a change from the stones and new beads, back to some old favourites, 3 Organic Bubbles! 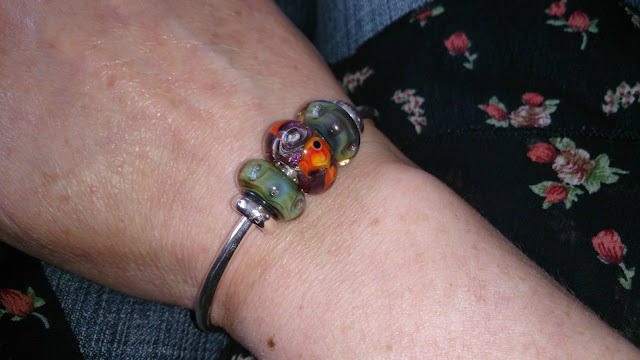 Saturday I came home to find a little parcel waiting for me, my new Luccicare bead, a magnificent fishy... guess what went straight on my bangle and is still there today?! And so my 2 week challenge comes to an end, after 2 weeks I'm now much more comfortable putting the bangle on and off, if I'm honest it still makes me a little green at times but it really has been worth putting the work in, so much so that over the last 2 weeks I've really had to struggle hard to not buy a 2nd bangle with another Aurora bead. This is still probably the best deal if you want the bangle and the Aurora! *phobically challenged is probably the more correct terminology, as I don't have anything physically wrong with my wrists - it's just not such a catchy title! I agree with Victoria, "Wash'n'Go" is perfect! 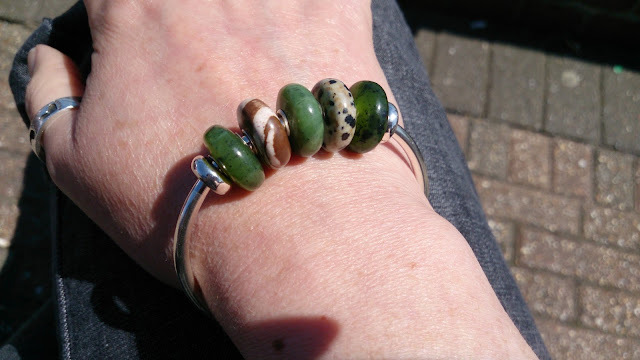 I've been wearing it practically non stop apart from that 1 day, it's great for showing off small groups of beads - love my S&B bangle combo, but equally great for one bead too. Tivoli did look utterly fab, I dread to think how financially nuts I would go there given the choice, after seeing what I bought just locally... ah maybe next year. 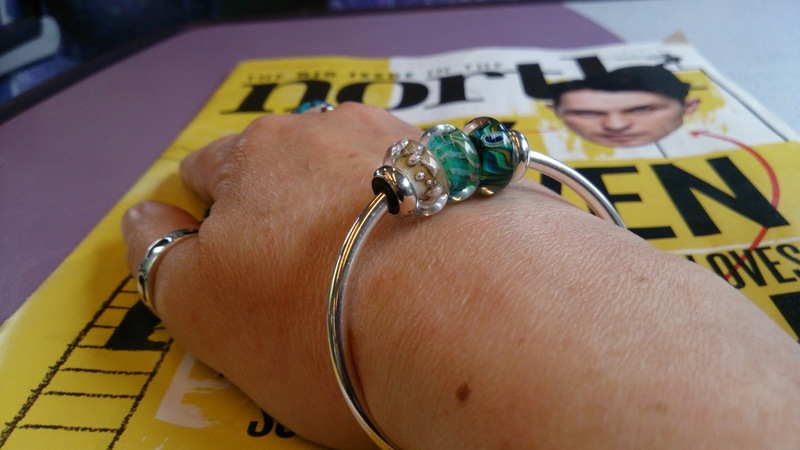 I'm a huge fan of the Trollbeads bangle as I think anyone who reads my blog knows. "Wash n Go" is perfect terminology in fact! Perfect Kay! I agree with you on all points. As much as I love it, it's still a pricey investment and like you, that's what has stopped me buying a second. It's been a close run thing last week as I was so tempted, but luckily got distracted by my perfect agate dendritic stone instead, which is a tad cheaper! Unfortunately all tax refunds do run out eventually so my spending spree is sadly coming to an end... I did go and try on a Story bracelet a few weeks ago, the garnet beaded string one, and a few others - came away empty handed (was being good) but definitely love those beaded ones! But yes, you can definitely add me to the bangle fan club! I'm really loving your small and beautiful bangle with the meteor, tiger stripes and peacock! I keep scrolling back up to look at those divine S&Bs! They do make a fab trio, and discovered this by accident as I was putting on my bangle just to photograph them initially... a very happy accident! Yes with Story I did my usual of not asking prices and just asking to try on, initially I picked out all the most expensive options on the beaded bracelets... I then took a look at the "book" and tried the cheaper versions (read still expensive but half the price), hadn't noticed the garnet originally but when I tried it on it was "my" colour - should have known really as I love garnet! Did reply to your last email but I think it got returned as undelivered, been super busy with my day job this week so it's all merging into one! Our shed is finally coming next week (we hope) so will be able to get things a bit more organised and I won't have to keep tripping over all our camping gear which is currently living in our dining room and kitchen! UK summer has been a bit dismal so far so we've still had to have heating on now and then to take the chill off the place, love old houses but sometimes they just need to be warmer lol! I keep going back to my original summer stones photo from my Troll Date haul, have taken quite a few photos since then, but there's something about that particular photo that just makes me happy, probably the feeling it evoked at the time in the shop... super happy to have my Summer Stones!